Violet squill Ledebouria socialis, photographed by Stan Shebs. 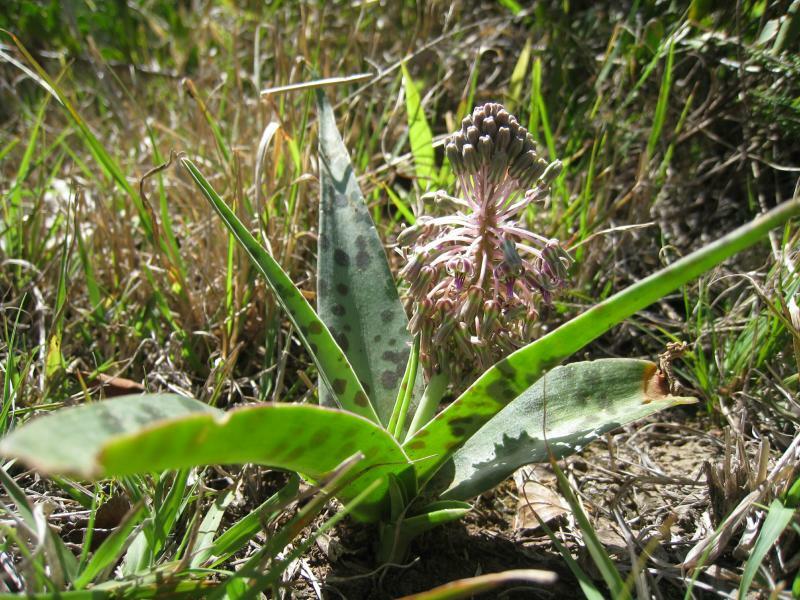 The south of Africa is one of the world's centres for botanical diversity. Home to an abundance of the floristically wierd and wonderful, you might be surprised to know just how many of your favourite garden plants (assuming that you have favourite garden plants) originate from that part of the world: proteas, leucadendrons, red-hot pokers (Kniphofia), freesias, agapanthus*... to name a few. The subject of today's post, the genus Ledebouria, is perhaps not one of the best known of the southern African contributions to horticulture, but it's none the less noteworthy. *Well, personally, I'm not that fussed on agapanthus ('orrible weedy things), but a not insignificant number of people would disagree with me on that point. Ledebouria is a genus of the plant family Hyacinthaceae that also includes such familiar plants as hyacinths and bluebells, and within that family to a group known as squills. Like other members of the family, Ledebouria species are bulbiferous with developed leaves only present for part of the year. There are about forty or more species of Ledebouria in southern Africa, with outliers in Madagascar and India (Manning et al. 2004), though the number of species varies according to whether or not the genera Drimiopsis and Resnova are treated separately. 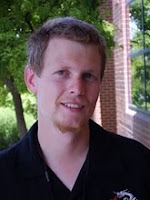 Molecular analyses have tended to fail to distinguish the three genera, but morphological and combined analyses support their reciprocal monophyly (Lebatha et al. 2006). The Drimiopsis and Resnova species have more loosely packed leaves in the bulb than the species of Ledebouria sensu stricto (Lebatha et al. 2006) and are mostly woodland and forest species as opposed to the open-country Ledebouria (Manning et al. 2004). Some species of Ledebouria have become popular as houseplants, not for their flowers which are reasonably modest, but for their leaves which are fleshy and marked with dark purple blotches and stripes. 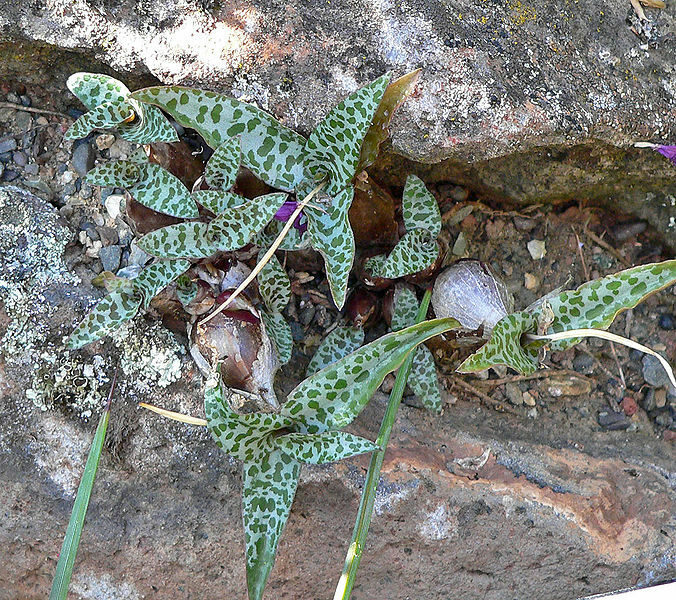 The number of leaves produced from one bulb at a time varies from up to twenty-five to only a single leaf in Ledebouria monophylla. Mature plants may be up to a metre tall in L. zebrina, down to only 3 mm high in L. galpinii (Venter 1993). The latter (as well L. monophylla) is one of a number of species in which the leaves grow tightly pressed to the ground, so despite the low height of the entire plant, the individual leaves are up to 80 mm long. In such species, the total number of leaves at a time is always low, never more than five. This growth habit is known as geophylly, and the reasons behind it remain uncertain. Geophyllous plants are generally found in areas with strongly seasonal yet regular rainfall (Esler et al. 1999). It has been suggested that the geophyllous habit protects against grazing animals or against CO2 or water loss; alternatively (as favoured by Esler et al. ), it may create a microclimate that affects the temperature of the leaves, either causing their temperature to remain low in the mornings (allowing dew to form on the leaves) and/or raising the temperature of the leaves during midday (allowing elevated rates of photosynthesis). Leaves of Ledebouria ovatifolia ssp. scabrida, a geophyllous species, photographed by Connall Oosterbroek. As already alluded to, most Ledebouria plants form flower spikes bearing only pale flowers, though many species may produce more than one spike in succession over a single growing season. Flowers are insect-pollinated by Lepidoptera and Hymenoptera. Fruits are dry capsules, and the seeds are dispersed short distances from the parent plant by wind (generally by being scattered from a waving spike) or water (mostly by falling rain). 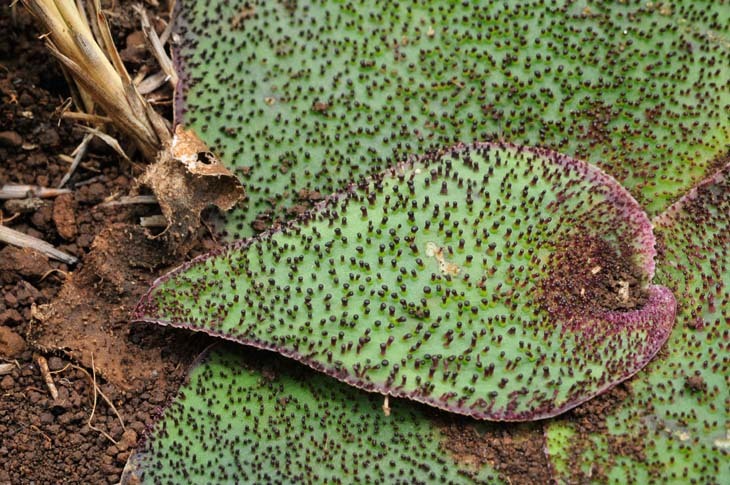 Some species form lateral bulblets, such as the aptly named Ledebouria socialis (see this page on L. socialis as a house plant), leading to the formation of colonies of plants connected by subterranean stolons up to 200 mm long. 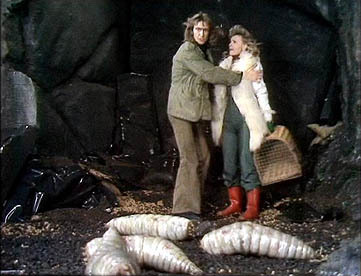 The largest recorded such colony, for a clone of L. cooperi, had a diameter of five meeters (Venter 1993). Esler, K. J., P. W. Rundel & P. Vorster. 1999. Biogeography of prostrate-leaved geophytes in semi-arid South Africa: hypotheses on functionality. Plant Ecology 142 (1-2): 105-120. Lebatha, P., M. H. Buys & G. Stedje. 2006. Ledebouria, Resnova and Drimiopsis: a tale of three genera. Taxon 55 (3): 643-652. Manning, J. C., P. Goldblatt & M. F. Fay. 2004. 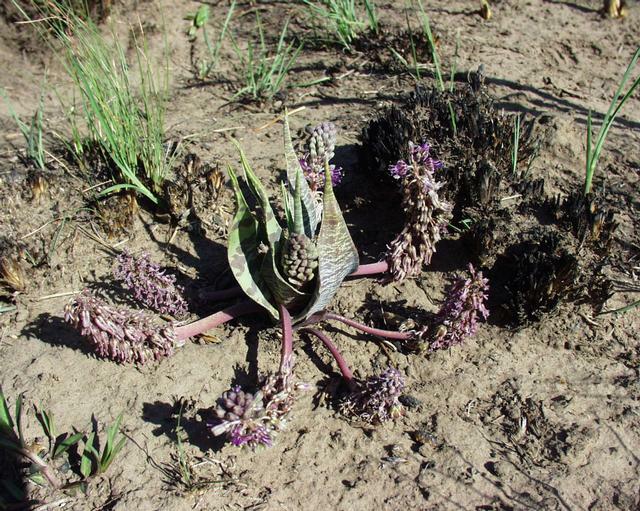 A revised generic synopsis of Hyacinthaceae in sub-Saharan Africa, based on molecular evidence, including new combinations and the new tribe Pseudoprospereae. Edinburgh Journal of Botany 60 (3): 533-568. Venter, S. 1993. 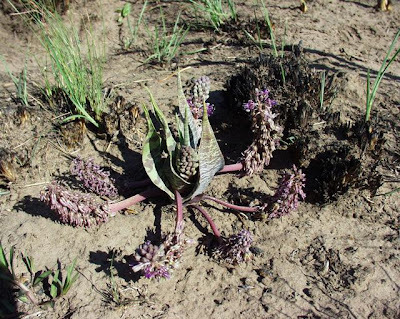 A revision of the genus Ledebouria Roth in South Africa. MSc thesis, University of Natal. Günther Kunkel suggested that deserts (and semi-deserts in danger from dertification) could be encouraged to produce more abundant vegetation by paving them. If half the soil is covered in stone only half the water is lost from the soil surface. Desert plants would grow in the parts between the paving and root below it. Geophylly would seem to have a similar effect. I assume you have seen Rheum palaestinum which, as well as being geophyllous has its huge leaves pleated like a river valley system to guide water to the centre of the plant.